“The majority of chemical substances in commerce have no established occupational exposure limits (OELs). In the absence of established OELs, employers and workers often lack the necessary guidance on the extent to which occupational exposures should be controlled. 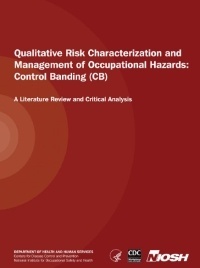 A strategy to control occupational exposures that may have value when there are no relevant OELs is known as control banding (CB). CB is a qualitative strategy for assessing and managing hazards associated with chemical exposures in the workplace. The question about the utility of the CB strategy for workplaces in the United States has been raised, warranting a critical review of its concepts and applications. This report is the result of a review of the published literature and related proceedings on CB. Control banding is a potentially valuable tool for risk management of source chemical agents and other occupational hazards. Despite limitations, in the absence of OELs, CB may be a useful strategy for assessing and controling occupational hazards as part of a comprehensive safety and health program. CB is not meant to be a substitute for OELs. The use of CB does not alleviate the need for environmental monitoring and industrial hygiene expertise. CB strategies may be useful for providing hazard control guidance to small and medium size enterprises (SMEs); larger businesses may find CB strategies of greatest utility for prioritizing hazards and for hazard communication.